Happy “9th”? birthday to Duchess!!! 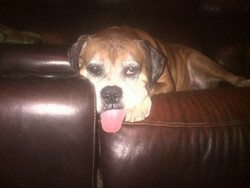 We were so lucky to adopt Duchess (formerly known as Ducci) from Austin Boxer Rescue last year on 6/23/12. She is a very young at heart “silver” girl – likes to boing and sticks her tongue out when she’s happy (so pretty much all the time). She loves to snuggle and just a generally happy girl – we are so fortunate to have her in our home and hearts.